Marvel's Agents of SHIELD has pulled off a better trick than turning a helicarrier invisible: This Avengers TV spin-off has quietly gone from "pretty decent" to "brilliant, must-watch television." If you're not watching the Agents of SHIELD, here are 10 reasons why you should absolutely start. Sure, it seems daunting to launch into a show that's already been on the air for over a year — but luckily, now is a great time to dive in. Agents of SHIELD more or less reinvented itself at the end of its first season, in the wake of the events of Captain America: The Winter Soldier. 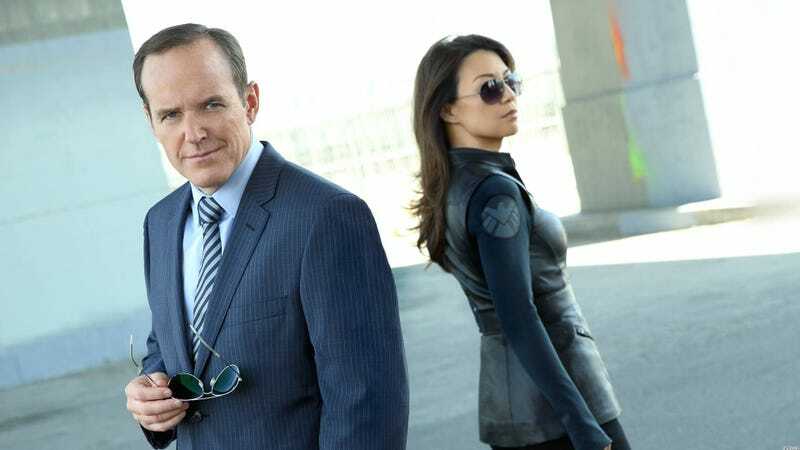 There is some mythos involving Phil Coulson and Skye, but it's mostly pretty self-explanatory — mostly what you need to know is that the evil ex-Nazi organization Hydra infiltrated SHIELD and now what remains of SHIELD is disgraced and on the run. If you absolutely want to get caught up, though, here's our guide to which episodes from season one you need to watch. It's rare that a TV show pulls the rug out from under you as deftly as Agents of SHIELD has, on a few occasions. There have been a few really startling reveals, towards the end of season one and going into season two, which have helped make the characters a lot more interesting and set up the sense that anything can happen. It's also gotten closer to being more like a comic book on television, with a decent mixture of standalone plots and arc/soap opera storytelling, with enough twists to keep you coming back. Most of all, it's turned into a show that's not afraid to take some big risks. Lately, it feels like every other new science fiction show is about superheroes — it's the hottest new genre. And oddly enough, Marvel's only broadcast TV show is one of the least superheroic things on TV right now. There are no costumes, no secret identities, no origin stories and no saviors — it's closer to Torchwood than Arrow. If you want to see a straight-up show about mostly regular people doing their best in a world of superscience and aliens, this is it. Again, that's something we were hoping for from this show all along, and it's delivering more and more. Because the movies have laid claim to the big guns, like the Hulk and Thor, this show has no choice but to spend a lot of time delving into the grungier, more minor characters. Like Deathlok, Mockingbird and the Absorbing Man. The sort of characters who will never get their own movies, but who are often the most fascinating thing about the comics. That second part is important — this team was far too well-adjusted for far too long. But now that they're starting to get put through the wringer in a major way, it feels totally earned and it's impossible not to sympathize with their misery and dysfunction. Plus the huge status-quo change after the second Captain America movie means that these folks are underdogs now, which is always way more interesting to watch than a team who are on top of the world. This is another area where Agents of SHIELD has advanced by leaps and bounds in the past six months. The relationships between the major characters have gotten more complicated and layered — the love between Agent Coulson and his right-hand woman, Melinda May, is particularly fascinating. And as Leo Fitz, the team's techie, has gotten into worse shape in the wake of his drowning at the end of season one, his relationship with his lab partner Gemma Simmons has gotten a lot weirder — but he's also started to have really interesting relationships with a lot of the rest of the team. And then there's Grant Ward, who used to be the team's sharpshooter and is now something a lot stranger and darker, and who has a relationship with the young Skye that's by turns creepy and sweet. There are hints of romance here and there, but for the most part these relationships are more like friendships — with real, solid, personal conflict. At its best, this show feels like it's about adults who are navigating difficult terrain together. That's the other great thing about Agents of SHIELD: It's nailed the tone that it needs to have. The humor is "clicking" a lot more, and is coming out of the characters more than it used to. The quippy, zany tone isn't overwhelming the story or action, nor is the show wallowing in darkness — in fact, the show's mastery of its chiaroscuro action-adventure tone is a big part of what's made it so downright watchable lately. So hey — there's another Agents of SHIELD on tonight, and if you've drifted away from this show, it's worth giving it another shot.